Our 3 day first aid at work training is aimed at those organisations where a first aid needs assessment indicates a higher risk environment. How do we approach first aid at work training? We’ll provide delegates with a variety of printed course materials including workbooks and handouts. On successful completion of this course delegates will receive a printed course certificate indicating compliance with the Health and Safety (First Aid) Regulations 1981. 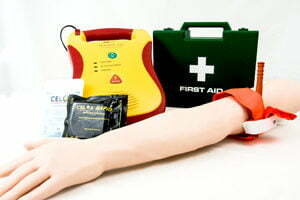 Our First Aid at Work course is just one of over 60 courses we offer. Acorn Health & Safety provides training and consultancy in first aid, fire safety, food safety, manual handling, healthcare training and health and safety.